New Delhi: An environment ministry draft note has acknowledged a “rise” in the number of deaths due to air pollution in the country, which contradicts its long-standing position on the “absence” of credible data to link morbidity to pollution. The ministry’s observations form part of a note inviting comments and suggestions, till May 30, on the draft State of Environment Report (SoER) 2015 from all stakeholders, where it uses Indian as well as global studies as citations. “Studies across the world and also in India prove that outdoor and indoor air pollution is a serious environmental risk factor that causes or aggravates acute and chronic diseases and has been identified as the fifth highest cause of morbidity in India,” it says while quoting a study. Quoting an Organisation for Economic Development and Cooperation (OECD) report, it adds that the country has witnessed a rise of around 12 per cent in the number of deaths due to surface-level ozone and PM 2.5 between 2005 and 2010. The OECD report, published in 2014, had said in 2005 there were around 6.2 lakh deaths while they climbed to around 6.9 lakh in 2010 due to pollution. Referring to another study, it says that an estimated 2.4 of 5.6 million cases of chronic bronchitis, 0.3 of 0.76 million cases of tuberculosis, 5 of 51.4 million cases of cataract among adult Indian women and 0.02 of 0.15 million stillbirths across India are attributable to household air pollution due to biomass cooking fuel. “Using India’s 2003/04 District Level Household Survey II data, it has been found that usage of biomass and kerosene cooking fuels by women is related to stillbirths. 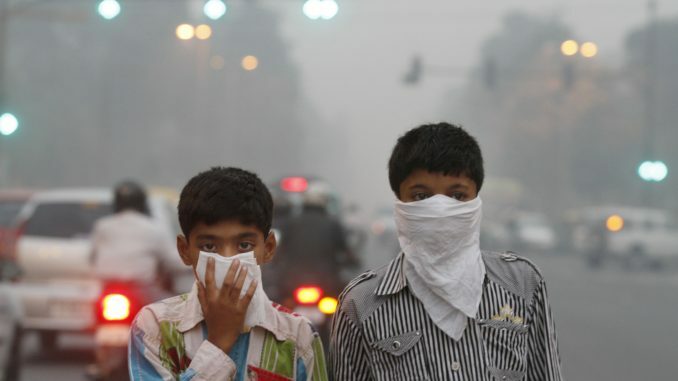 Annually, 400550,000 premature deaths have been attributed to indoor air pollution in India. There is consistent evidence that indoor air pollution increases morbidity and mortality from respiratory tract symptoms in childhood,” it says, quoting from two separate studies. Dave had expressed his reservations on the report and had announced that a study would soon be conducted by the Health Ministry on the issue. The late Union minister, while iterating his views on various reports linking deaths to air pollution, had asserted that a proud nation always believes in its own data while noting that such reports are often based on extrapolation “without” due scientific validation. The government had told the Rajya Sabha in April that studies conducted abroad regarding deaths in India due to pollution are based on extrapolated data and are thus not correct.